(July 21, 2012) It is with shock and deep sadness that I am reporting the passing of Charles Nagy (N2VLT) of Staten Island, NY. Charles was a long-time friend and fellow member of the NYC Amateur Radio Emergency Communications Service. It was not unusual to not hear from him for a while, especially as he traveled or ran "errands" since his retirement last year. 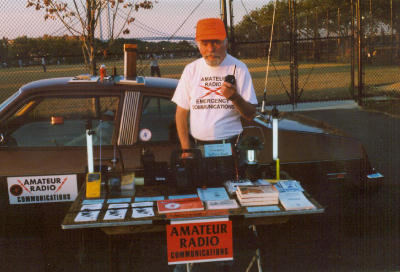 Charlie was an intelligent and caring man who had many interests beyond amateur radio. Growing up in the eastern part of the Bronx, Charlie had a keen insight to a budding photography and music avocation while in high school. His parents instilled in him a sense of learning what you can to both improve yourself and provide a means of making a living. His photography skills led him in various professional and personal pursuits. When videography became affordable, he mastered the VHS video camera before moving on to the digital realm. His photography and interest in the sciences led him to years of work with the Tesla Society, where his summer vacation was spent in Colorado for their annual conventions. His musical interests led him to playing the electric bass guitar, keyboard and how to master the sound boards as well. He hooked up with fellow Bronxite and actor Chazz Palminteri who was a long-haired lead singer for their band called "Razzamachazz" to tour for the USO during the Vietnam War era in the early 70's. In later years, Charlie would acquire, repair, collect and help others with electric bass guitars. Periodically he and Chazz would meet up with fellow band members for lunch or dinner as their careers took different directions. Charlie worked many years for Continental Airlines at Newark Airport, taking on various logistical, electronic repair and coordination duties for the operations department during the afternoon/evening shift. This allowed him to stay up into the early hours of the morning teaching himself computer skills, basic electronics and eventually getting his amateur radio license in 1993 with an FCC issued callsign of N2VLT. As an amateur radio operator on Staten Island, first with the Staten Island ARES group and then as a member of NYC-ARECS, Charlie was a valuable asset behind the scenes. He took his operational and logistic skills to help in record keeping, developing how-to videos for packet radio (digital messaging) and created the fine-tuned script for the weekly on-the-air radio nets. Today's NYC-ARECS script is not that much changed from the one that N2VLT created in the spring of 1997. While he could not participate in the various public service activities of the group like the various walks, races and marathons, he was always available as an overnight Net Control station should an emergency activation happen that required the services of the amateur radio group. Charlie retired from his position at Continental Airlines in late September 2011. During his last nine months, he spent it trimming down some of his possessions, learning more about his various hobbies and planning to travel more. Charlie will be missed by all who knew him. His strong faith in his Creator kept him on an even keel and he cherished each day that he was above the ground. He may have bristled at some of the wrong directions our society was heading, but he was never depressed by them. He would not want us to be depressed by his passing, but to take what we have and move forward in perfecting ourselves in the many aspects of our lives. In the Hungarian of his ancestry, "Isten konzol a szomorú szívu, akik lemaradnak, és megteszi a halottak a mennyek" (God console the sad-hearted ones who are left behind, and take the dead into the kingdom of heaven). Farewell, my good friend. We will all miss you.